It has just been announced in a hurriedly called press conference, that the sponsors of the fashion week beginning in New Delhi tomorrow have decided to rename it Will Slip-up Week. Other names that were also considered were Pr't Failure and Slip Blips. This decision was taken with much alacrity when it was revealed that the deluge of wardrobe malfunctions at the recently concluded fashion week in Mumbai were premeditated and designed to generate media hype. The motives of the fashion fraternity were exposed by a high profile team of investigators who worked non-stop and came to the conclusion after investigating from close-range both the offending garments and the models. It has finally been ascertained that the acts were deliberate and conceived by the designers. Never before has an Indian fashion week drawn so much attention from both the press abroad and at home. International merchandisers are finally taking note of Indian designers and the cash registers haven't stopped ringing since then. The models Carol Gracias and Gauhar Khan have apparently bagged top international assignments post their disclosures. To cash in on the sudden attention, the fashion fraternity has heartily agreed to the sponsor's demand to rename the ' la mode celebrations to officially celebrate designer fiascos. Dilli-wallahs do not wish to be left behind Mumbai and are leaving no stone unturned to make the show a grand success. The culture police in the capital has been asked look the other way for a while so that India can make its mark on the haute couture map. This hasn't proved to be very difficult as the Page 3 personalities and politicians who so selflessly double up as the 'Guardians of Indian Culture and Morality' are too busy clamoring to ensure that they get the best seats in the shows. To ensure that everyone enjoys these garment glitches to the fullest, elaborate photography and recording equipment is being arranged. Those who are unable to attend the shows need not worry about missing the excitement. You will be able to buy CDs and download short clips onto your mobile. A prominent television channel has been awarded exclusive telecast rights and it is canceling the screening of its popular soaps for the whole week to beam all the performances live. Soap addicts fret not - you will be able to spot both the saas and the bahussitting in the audience. The ad spots on the channel have been sold-out in a jiffy and this is being touted as the biggest spectacle since the last World Cup. The fashion week is being co-sponsored for the first time in the history of Indian fashion industry by a mobile phone company and not a cosmetics or personal care brand. This company boasts that its camera phones take the best pictures and videos of moving objects, even in the dark. Needless to mention that this is the same company whose handset sales shoot up every time a MMS scandal hits the headlines. The co-sponsor is making provisions to provide camera phones to all invitees. Stringent standards are being applied by the organizers to ensure that the malfunctions are successful and only designers with previous experience of such gaffes are being allowed to present to international buyers. To ensure the success of their outfits, designers are competing with each other over the most innovative, elaborate and complicated malfunctions. They are working overtime to churn out seams that split and stitches that snap. Suddenly attires that challenge are in! A leading designer-duo has trashed their entire collection and is now working furiously to put together an entire ensemble that promises to fall apart in split seconds. It has also been learnt from reliable sources that some designers have asked their models to dump their stilettos for sneakers and make quick exits off the ramp in case the malfunction doesn't succeed. Fashion accessory suppliers are receiving frantic calls from designers for substandard fasteners, flawed hooks, imperfect buttons and defective zippers. The price of rejects has sky-rocketed overnight. The domestic suppliers are finding it difficult to meet the sudden domestic demand and one ingenious vendor has airlifted stock from abroad. A prominent female designer is reported to have enlisted the underworld's help in getting her stock of faulty zips and hooks from a reluctant merchant. Choreographers can be seen huddling and watching videos of the bloopers from last week in an effort to better themselves. Models are competing to bag the most novel glitches. Last heard Janet Jackson has been flown in by a leading designer to train the models on how to ensure that the malfunction works seamlessly. She will be giving a few lucky models valuable tips on how to rub oodles of body lotion to ensure that the skin offers minimal support to clothes. The right gestures and reactions are being practiced for the cameras and rehearsals are running into late night to perfect the 'Oops' Look. I would love to stay and share more niceties with you darlings but I just don't have the time for a leisurely tittle-tattle. 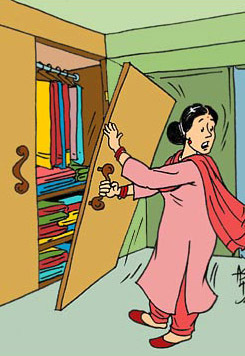 I have to rush to my darzi to pick up my own malfunction designer threads to wear to the Will Slip-up Week!